We LOVE us a styled photo shoot!! It gives us the chance to really stretch our creative legs and dream up whatever we want without any boundaries. Throw in this dream team of wedding professionals and some 70’s inspiration (our favorite decade!) and we are sold. When I was in high school (a very long time ago, but not as long ago as the 70s) my friends and I used to doodle on our already distressed jeans. For the main “card” I bleached some denim and doodled the design. We finished the look with a rainbow love button! Yippee Hippy! The signature cocktails were appropriately titled and garnished with fruit and flower ice cubes! Belovely created this AMAZING string art ceremony backdrop! 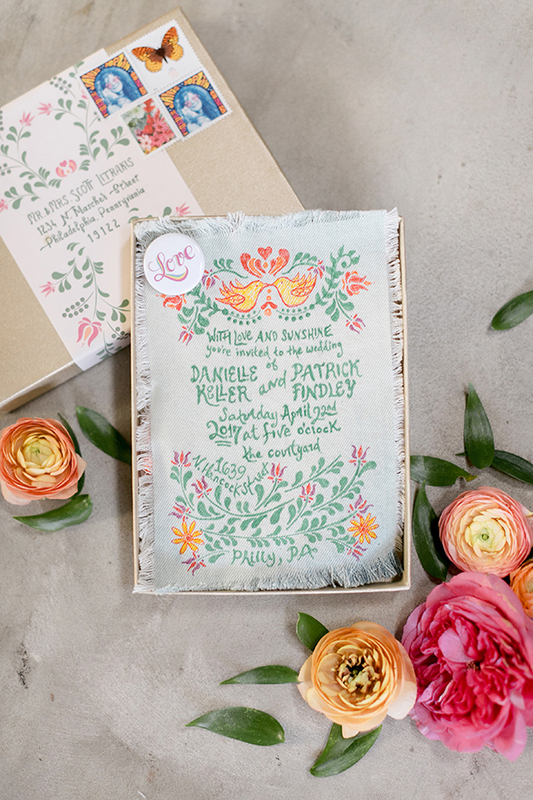 We layered the fringed denim with a wooden reply envelope and an rsvp card in classic type festooned with colorful florals. A peachy pom pom ribbon completed the look! Bold and bright, happy and hippy menus topped these whimsical plates from Anthropologie.